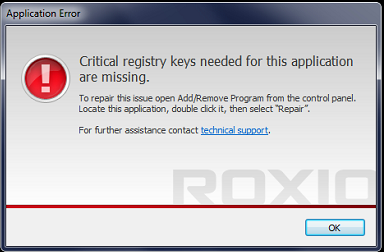 I'm trying to resolve an issue where the Roxio Burn component of Creator NXT 2 only throws up an error window saying "Critical registry keys needed for this application are missing." This just generally prevents using it, and the CD for NXT2 is no where to be found either else I'd have run the repair from that first. Unfortunately this only made the issue worse in that every time a CD is put into the computer now it generates this error, even when not using that software. Machine is Windows 7 x64, so quite old. I'm trying different things but if somebody could provide the assumed registry keys that would be brilliant to try and repair this. Any more info needed, just let me know.